Special TMS combo pack consisting of 10 tubes Green Glue Damping Compound and 2 tubes Green glue Sealant. Damping is used between 2 layers of drywall or plywood to soundproof and the sealant is used at the perimeter to seal all the gaps. Nozzles and installation guide are included. 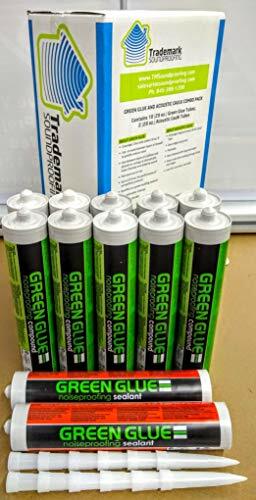 Includes 10 Tubes Green Glue Compound and 2 Tubes Green Glue Sealant. If you have any questions about this product by Green Glue, contact us by completing and submitting the form below. If you are looking for a specif part number, please include it with your message.